The San Diego Fleet will have a different starting quarterback when they play their first home game next Sunday. Philip Nelson will start against the Atlanta Legends at SDCCU Stadium after entering Saturday night’s 15-6 loss to the San Antonio Commanders on the Fleet’s first possession of the fourth quarter. Coach Mike Martz replaced Mike Bercovici following his second interception. Nelson was the starting quarterback for the Martz-coached Team National in the 2017 NFLPA Collegiate Bowl college football all-star game. Nelson completed five of 10 passes for 68 yards with one interception Saturday. After being forced to punt after three plays on Nelson’s first possession, the Fleet picked up three first downs on his second, including converting a fourth-and-six situation on Nelson’s 10-yard pass to receiver Brian Brown. A 29-yard pass from Nelson to Brown — the Fleet’s second-longest play — gave them a first down on the Commanders 8-yard line. The drive ended on the next play when Zack Sanchez intercepted a Nelson pass at the goal line. The Fleet chose Nelson with the final pick of the third round of the Alliance of American Football’s quarterback draft Nov. 27, the 24th overall selection. Bercovici was the first pick of the second round, the ninth selection. Nelson started the final seven games of the 2012 season as a freshman with the University of Minnesota, started most of the 2013 season, transferred to East Carolina where he was the starter in the 2016 season. Nelson was in the 2018 training camp of the Canadian Football League’s Winnipeg Blue Bombers. Martz implied that Bercovici would regain the starting position after he becomes more familiar with the offense. Bercovici was sacked six times, with his helmet coming off on the first sack. One factor in the sacks was the absence of center Jeremiah Kolone, who rolled an ankle over Bercovici’s foot in practice Thursday, Martz said. Left guard Damien Mama was shifted to center to replace Kolone, Martz said. The Fleet were held to 47- and 28-yard field goals in the final one minute, 17 seconds of the first half by Donny Hageman, a San Diego State alumnus who was signed Wednesday. The Commanders broke a 6-6 tie when Kenneth Farrow II ran 3 yards on the first play of the fourth quarter for the game’s only touchdown, two plays after cornerback De’Vante Bausby intercepted a pass by Bercovici at the San Antonio 32-yard line and returned the ball 19 yards to the Fleet’s 49-yard line. AAF rules require teams to attempt two-point conversions. San Antonio quarterback Marquise Williams was tackled short of the goal line on the two- point conversion attempt. On its next possession, the Commanders consumed 11 minutes, 26 seconds with a 17-play, 75-yard drive culminating with Nick Rose’s third field goal, a 28-yarder, with 3:34 seconds left. 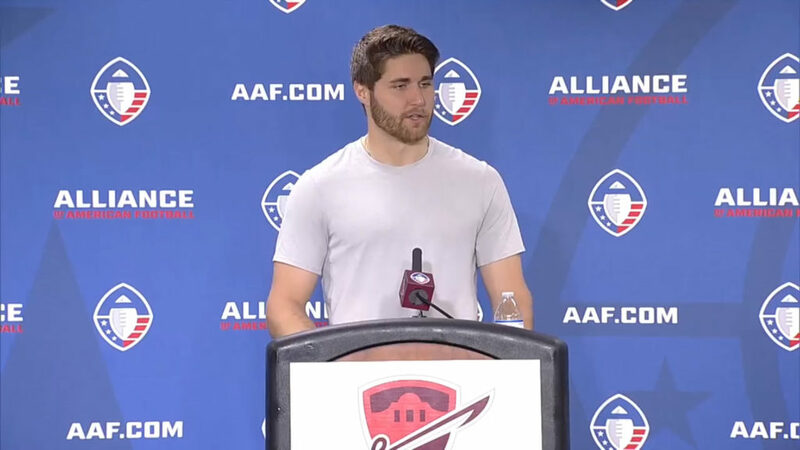 “I like where we are, I really do,” Martz said after the Fleet played in one of two games marking the AAF’s first day of play. Atlanta was a 40-6 loser to the Orlando Apollos in Saturday’s other AAF game.